Indianapolis is the capital and most populous city of Indiana, with over 800,000 residents. It is also the 29th largest metropolitan area in the United States. The city center of Indianapolis is highly urbanized, with a number of large high rise buildings peppering the downtown area. The Greater Indianapolis area forms a metropolis of around 2.5 million residents and is comprised primarily of large suburban swathes. 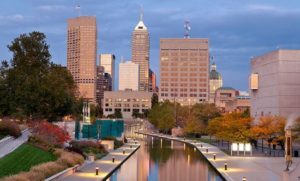 Indianapolis is home to a ‘humid continental climate’, meaning that it experiences four distinct seasons per year. Summers are hot and humid, while winters are typically cold. Spring and autumn months are typically mild and pleasant. As such, the city and surrounding area is home to the range of typical pest problems that are found in most temperate cities. Common pest problems in the Indianapolis area include ants, mice (and other rodents), termites, and pest birds. Mice can present as a particular infestation problem in all types of dwellings and are typically attracted to food stores and warm, dark places. Mice and other rodents can cause health problems for co-habiting humans, as they carry various germs and diseases which can be spread through their urine and droppings. Rodents are also capable of chewing through all manner of wires and cables, leading to service faults at best and dangerous electrical infrastructure compromises at worst. Mice infestations can often be addressed by residents with the use of traps or baits; however, these can have varying degrees of success. To thoroughly eradicate a rodent infestation problem, concerned homeowners should enlist the services of a licensed exterminator who can guarantee the complete removal of any rodent problem from a property. One pest problem that is often overlooked, but is nonetheless very common in suburban areas of Greater Indianapolis, is that of pest birds. Birds often nest in the eaves of a house and can also enter and nest in internal roof spaces. In most cases, this is simply a messy and annoying nuisance. However, pest birds can also prove a health risk to a dwelling’s occupants when left unchecked. This is thanks largely to the bird feces that can accumulate in and around your home, as well as the mites, ticks, and other disease spreading insects that birds often carry. What’s more, birds can cause serious structural damage to your property over time, blocking gutters, dislodging roof tiles, and damaging timber. To effectively remove pest birds from your home and stop them from coming back, it is advisable to enlist the services of a pest control agent that specializes in bird removal. A well-known pest control company in the Indianapolis area is Circle City Pest Control, which services Indianapolis and the wider Central Indiana area. Circle City Pest Control provide a range of pest control services, including treatments for common household pests such as fleas, ants and mice. They also offer treatments for flying insects, such as bees, wasps and hornets. Circle City also offer free inspection services and provide a protection guarantee that your domicile will be rid of the treated problem after an extermination is carried out. Other notable pest control companies servicing the Greater Indianapolis area include Insight Pest Solutions, Pest Control of Indianapolis and Arab Termite & Pest Control Inc.